Not very much was known about tattooist C.H. Fellowes before Carmen Nyssen started her research. Carmen is a very diligent researcher and we are proud to have her associated with the Tattoo Archive. All that remains of C.H. Fellowes is his sketchbook and a hand tattooing kit, found in 1966 in Providence, Rhode Island and later sold to a private collector. That same sketchbook and kit was donated to the Mystic Seaport Museum, in Mystic, Connecticut. C.H. 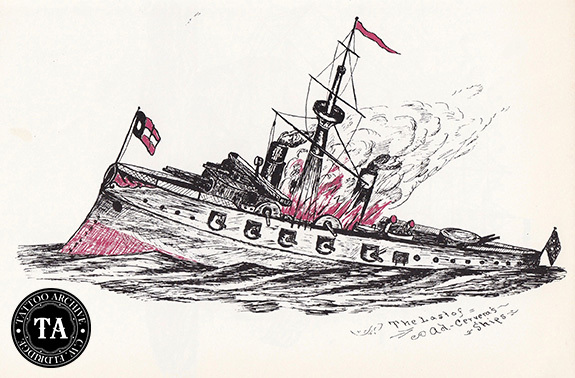 Fellowes’ sketchbook, The Tattoo Book was published in 1971 by the Pyne Press and is an interesting study of turn-of-the-century tattoo designs, mostly in black and red and featuring patriotic, religious and nautical themes. On the cover of Fellows’ sketchbook, embossed in gold letters is the name Warner Locks-C.E. Stumcke. In Carmen’s research she found Charles E. Stumcke was a Boston resident who was a buyer for Bigelow and Dowse Hardware at #229 Franklin Street in Boston. It appears that Stumcke had bought or was given the blank sketchbook by Warner Locks Hardware Company. These answers the question of where the sketchbook came from, but how did C.H. Fellows the tattooist end up with the embossed blank sketchbook? Come to find out that the Bigelow and Dowse Hardware Company had an employee names Charles H. Fellows. The final clue was in Fellows’ artwork itself. The sketchbook had a design with a ribbon and the initials G.W.B. in the ribbon. In 1895 Fellows married Jennie W. Baker. Carmen thought that Jennie could be short for Genevieve. Sadly she died the same year they were married. Other designs in Fellows’ sketchbook contained a ribbon with the initials C.A.S. In 1898 Fellows married Clara A. Steele. Lucky for us Fellows added some personal touches to his flash.